Z niepewnością instrumentu do 2milionowej cala (50 nanometrów tj. 0.05 mikrona) model Labmaster Universal - Model 175 nadaje się do praktycznie wszystkich aplikacji pomiarowych. Ten laserowy system pomiaru długości uniwersalnych (ULM) został stworzony na potrzeby kalibracji rozstawu torów, przy zachowaniu takich cech jak precyzyjnie zmierzona długość, średnica zewnętrzna, średnica wewnętrzna, średnica podziałki, zwężenie, przesunięcie liniowe. The ULM is capable of measuring gage blocks, end standards, plain rings, threaded rings & plugs, API gages, pin & plug gages, tapered plugs, cylindrical setting gauges, micrometers, indicators, LVDTs, calipers, and snap gauges with instrument uncertainty to 2 millionths of an inch (0.05 micron). It is suitable for virtually all ID and OD gage calibration applications through its wide 0.020-inch (0.5 mm) to 14-inches (356 mm) measuring range. 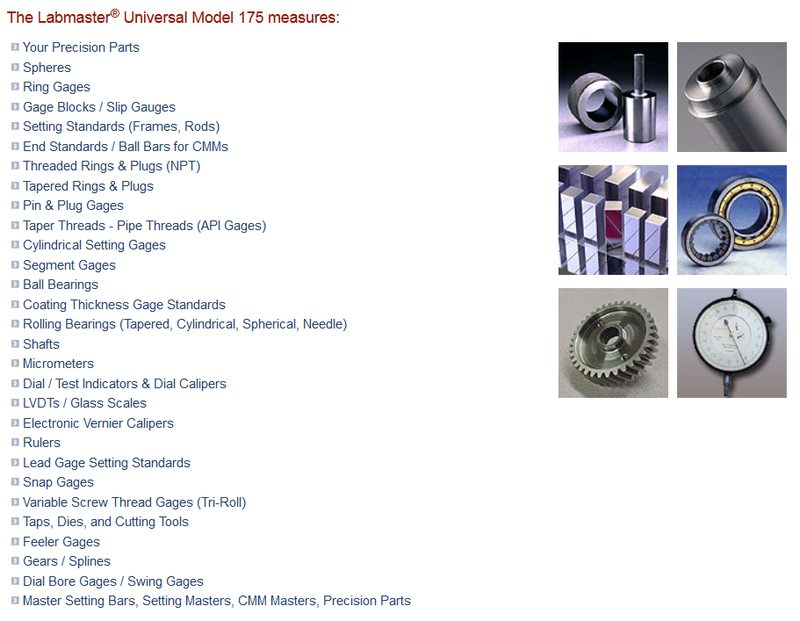 The ULM includes Pratt & Whitney’s GageCal software that automatically enters tolerances for rings, plugs, pins, balls, threads (calculates pitch/major diameter) and flags out of tolerance conditions. 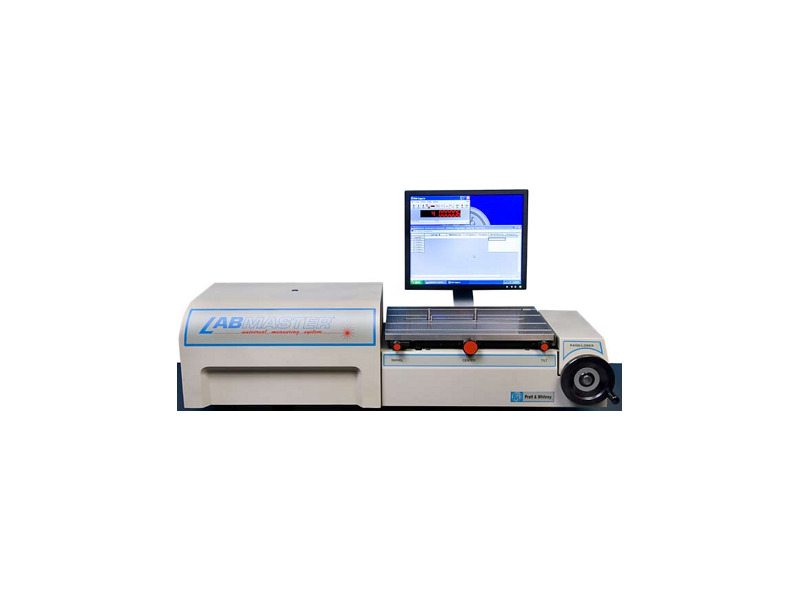 High accuracy is maintained by its laser interferometer, zero Abbe offset design, and large measuring table (100 lb [45 kg] capacity) with center position, height, pitch, and yaw controls. The computer-controlled precision air bearing slide and gaging probes remove operator-influenced errors commonly observed with traditional gaging methods by maintaining constant force. It also greatly minimizes wear and tear to both the measuring standards and the instrument. The large measuring table also acts as a soak plate. By design, the weight of the part will not affect the measurement because the table support is independent of the air bearing slide. This is not the case with traditional methods. 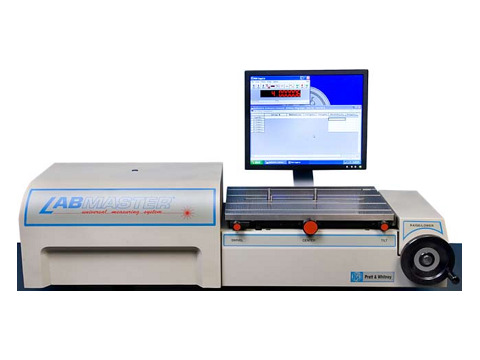 The Labmaster Universal Model 175 can also be configured around your bearing requirements to measure a wide range of anti-friction bearings; a new lab concept in industry (Model BM175). The five basic types of anti-friction bearings can easily be measured on the ULM. They include: tapered roller bearings, needle roller bearings, ball bearings, spherical roller bearings, and cylindrical roller bearings. Measuring characteristics include: internal diameter, external diameter, outer raceway diameter, inner raceway diameter, radial internal play (radial internal clearance/play) and axial clearance (axial internal clearance/play). Other specialty measuring applications include: gears, shafts, optics, film thickness, nano gages, automotive parts, aerospace parts including aircraft engine parts, and your precision concept components can all be measured on the ULM. Geometric measuring characteristics related to size include: positional tolerance (on axis), parallelism, perpendicularity, angularity, total runout (pass/fail).